It was Diwali time in India. Time to please the Goddess of wealth & prosperity; time to pay respects to the elders; time to welcome business New Year, time to feast; time to cheer with friends & relatives and the time to take a break. For my friends who are unaware, I have a brief description of Diwali - the festival of lights - as a foot note. Since schools are closed for a couple of weeks, families also plan their annual holidays around Diwali. Of course, summer holidays falling in April & May are the busiest. Diwali time would rank second. Because I am from the business community and also being my family's senior male member, I need to be around. I managed to steal half a day to make a quick trip to Karla Caves, about 50 kms from Pune. I started at 6 in the morning to catch the sunrise, the morning light and of course to avoid the mid morning heat whilst trekking up to the caves. I took the National Highway No. 4 towards Mumbai. After reaching Karla town, I turned right. The base of the mountain was about 2 kms from the highway. Fortunately, one can drive up half the distance thereafter which, you need to park and climb about 150 steps to reach the caves. The nearest railway station is Malavali, about 5 kms from the Karla caves. Those coming from Mumbai need to change at Lonavala and board the local train that stops at Malavali which is only a stop away. Auto rickshaws are also available at Lonavala to reach Karla. Likewise, a local train from Pune towards Lonavala will stop at Malavali. Using the local train is very popular by residents of Pune & Mumbai. The caves were carved out in the first century BC. It's a Buddhist Temple or Chaityas cut out of stone. It is the largest Chaitya in India. 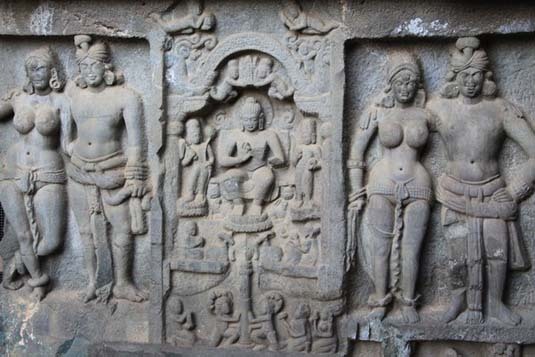 Carved out of solid rock are figures of men and women in various postures and elephants. There's an entrance fee of Rs 5 for Indian nationals and Rs 100 for foreigners. The cave is open from 9 AM to 5:30 PM. Since I reached the caves pretty early, I decided to take some pictures from the outside and head back. I reached Pune at 11AM in time to greet the Diwali visitors. The site also has a temple of Goddess Ekvira, the statue of which is believed to have emerged from the mountains. Aai (mother) Ekvira holds a very special place in the hearts of Koli (fishermen) community. Whilst I was atop, I saw many devotees paying their respects. During special days of Navratri (falls about 30 days before Diwali), the lines of devotees could be a mile long. One of my friend waited 3 hours to reach the deity. Driving to Karla was a very pleasant experience. 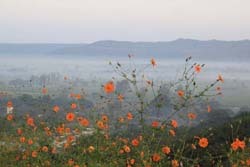 Because of the monsoon, the terrain was a spectacular combination of green sprinkled with wild yellow & orange flowers, blue sky and white fog. I made photo stops on the way, notably on a small hillock at Kamshet which is about 40 kms from Pune. The hillock is also the site for paragliding. In fact, I was expecting to meet some enthusiasts over there but missed the opportunity probably because the wind wasn't favourable or Diwali wasn't the right time to be around. 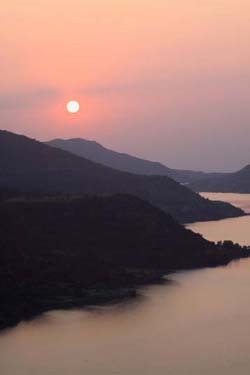 The next evening at about 4PM I headed to Lavasa. It's essential to have your own vehicle. Public transport would make the trip inconvenient and time consuming. Take the road that leads to Mulshi and follow the Lavasa signs. 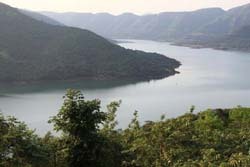 Lavasa is a new township coming up about 50 kms from Pune. A group of private real estate developers have made significant inroads in building this massive township nestled in the valley overlooking a massive lake. The rich have the option of owning weekend homes. For the rest of the enthusiasts, day trips are welcome. The township has hotels and serviced apartments for those interested in longer stays. The project is evolving and moving forward many facilities will be added. My prime motive was to capture the sunset. The view from Ekant - a restaurant at the top of the valley - is simply out of the world. Since the region had good monsoon, I rightly believed that the lakes at the foothills would be full to the brim. The one hour drive to Lavasa is quite fascinating. The road is excellent and it snakes up hundreds of meters to the top. I crossed a dam with its side gate partially opened that allowed the water to roll down in its full glory. Lush green pastures, yellow and orange wild flowers and the back waters of the dam all added up to make the landscape an awesome sight. I was witness to a great sunset. It would have been nice if some clouds were around to break the fiery orange ball and disperse the light. However, no complaints. A few hours atop and I headed home� well in time for dinner. 2 half-days well spent. 1. Diwali falls on an Amavasya (moonless night) sometimes in October or November. There's no fixed date because the Hindu Almanac follows the lunar calendar. 2. On Diwali day, Goddess Laxmi (representing wealth & prosperity) is worshipped. Lanterns and oil lamps brighten up the homes. Legend has it that Goddess Laxmi travels around on this moonless night and is attracted by the lanterns & lamps. 3. Fireworks are on display too. It's also believed that the sound and the light attract Goddess Laxmi. However, because of rising consciousness regarding the environment, it's good to see people keeping the fireworks to a minimum. 4. 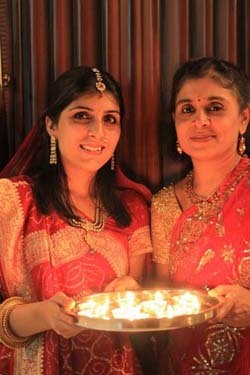 Diwali marks the end of the Business Year for the Hindus. Goddess Saraswati (representing knowledge) is worshipped alongside. New accounting books are part of the display to ensure that the business prospers in the coming New Year. The day is very important for the business community. 5. It's customary that every member of the family wear traditional dresses. Of course, there are exceptions. 6. Varieties of sweets and savories are prepared. These are offered to all visitors.